The last year or two has seen a sea of change when it comes to the design of Android apps. Unless the developer has provided exceptional functionality, he can no longer expect success if the app doesn’t look good. In the Design Love series, I’ll share some of the best examples of the growth the platform has seen. I’m still a bit in denial that Google would actually shut down Reader on July 1. A part of me hopes that Google would share a post saying “Gotcha!” to everyone else, announcing that they aren’t in fact, putting the service to rest. It’s not that I use it that much, it’s just that it’s an incredibly powerful tool for most bloggers. In fact, we extensively use it at Phandroid to keep track of our sources, and we still haven’t chosen an alternative yet. However, there are a number of other services that have tried to take advantage of the situation. Quentyn mentioned a few days ago about Digg Reader, and AOL is nearing a release. Heck, even Facebook was rumored to be building one in between, with some having thought that the Instagram Video event might actually be a launch for an RSS service. However, if a contest were to be held today, Feedly would win hands down. Not just according to me, but to you guys as well. What wins it for me is simply the fact that they have an Android app, and it’s gorgeous. I haven’t even given anything else a serious try because I read almost exclusively on my phone or tablet now. And in a time when reading habits are shifting away from the computers, I find it strange that over three months after the announcement, none of these other companies coming out with their new products have an Android app out, or would have by July 1. Any Google Reader user should feel right at home on Feedly really soon. Firstly, they invite you to import your Google Reader feeds into it, and secondly, a lot of the experience is similar to Reader, with a few coats of polish. All your sources are neatly tucked into a sliding drawer on the left, with the folders maintained from your Google account. The interface itself has a nice balance of being nice and clean, yet at the same time using larger images to add a touch of attractiveness. It doesn’t go overboard like Flipboard, which is important for an RSS reader, yet at the same time isn’t just a list of articles like a gazillion other apps. I particularly like the stack transition, which doesn’t quite have that wow-effect that Flipboard’s flipping does but ensures the app doesn’t have a mundane experience of simply scrolling up. I do have one complaint though, and it’s regarding the tablet version: I really wish the sliding drawer would stay open throughout while using the tablet. I often jump across sources and not being able to do that just seems like such a waste. 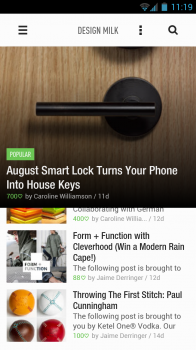 Overall, if you’re looking for a Google Reader replacement, or simply another reading app that looks good, Feedly is well worth a try. They are also working hard on their API side with the announcement of Feedly Cloud, hence giving the likes of gReader and other Google Reader-based apps something to fall back on. To download Feedly, click here. If you are using another reader app, do share it in the comments. Get the New Facebook Newsfeed style Right Now !